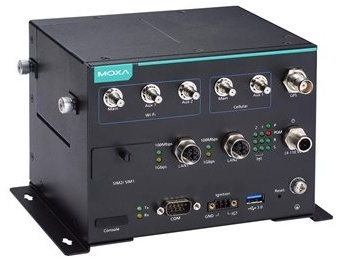 Moxa’s UC-8540 is an innovative computing platform designed specifically for transportation applications. The UC-8540 has 1 miniPCIe slot with USB signal to support 4G/LTE module, and 1 slot with PCIe/USB signal to support Wi-Fi module. The 4G/LTE module has two SIM card slots, which can be used to enable redundant cellular network communications or geo-fencing SIM card selection by leveraging the built-in ThingsPro for Rail, a Moxa devices remote management platform with wireless management. The UC-8540’s single-sided I/O design is ideal for vehicle applications, which typically do not have enough room for installing communication devices. The UC-8540 can be accessed on the front side to install or change SIM cards and wiring cables. Users can install or change wireless modules, mSATA cards or RTC battery from the top or bottom side for easy maintenance.